Over a chat with two of my little brothers (grand sons who are 8 & 11), I learned something from them. They said their father loves them. Tell Kor Kor (myself as the grand father) how dad loves both of you. From little brothers. Dad loves us. He bought laptops, games gadgets and electronic toys for us. He took us for holidays and shopping during the weekends. We know he works very hard because he has to take care of us. He has to pay all our educational fees, including pocket allowances. We don't like him when he is angry coz he has a fearful face. But deep down in the heart, we know he cares for all of us. He seldom allows us to talk to see our view. Whenever we want to say something, he insists that we have to listen to him first. How we wish he could be more understanding. Tell Kor Kor how he loves you. From their heart they spoke... Kor Kor is always cheerful. He makes us laugh all the time. He shares all the good thought for us to use. Lately he taught us to blog and explained the usage of being a good blogger. His stories are interesting and his words are inspiring. Though he is our grand dad but with his naughtiness and playfulness, we accept him like friends. We aren't afraid to call him Kor Kor. We are comfortable with him and darn to share our sorrow and unhappiness with him. We are so proud to have such fun and motivating Kor Kor as our grand dad. When I was as young as their dad, and my children were still schooling, I was behaving just like their father. I was so carried away from my career, I had forgotten my family. Being guilty for not spending enough time with my children, I replaced them with possessions and things which money could buy. By the time I realised I was wrong, my children had all grown up. Today with a better understanding of life and with some wisdom knowledge, I could make all my little brothers happy and smile which money cannot buy. To their father who also happen to be my second son, I wish he could add more fun and laughter on grooming his loving children. Yes! You are certainly a responsible dad and husband who loves everyone at home but without the happy heart, you won't see the beautiful surrounding. Son! I suggest you put more smiles and homour to yourself. Because when you smile, you look so handsome and friendly. When I returned to my own home in KL, I received a text message from their mother who wrote... "Thanks for visiting and bringing so much warmth to our home. Take care and have a safe journey back". Yes! I cried while reading these few words. 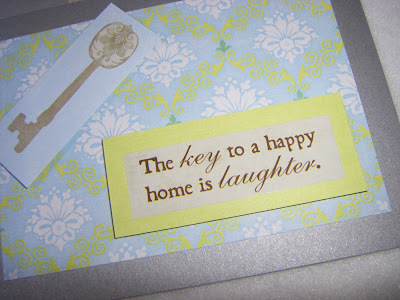 For my son - "A Happy Home...is filled with Love and Laughter". This is the most touching article I read today. Well done, big and small Foo. Shall I call you Princess Yaya or Teamama? Wondering whether the photo posted here is yourself! Mama sounds motherly like. Thank you for reading my blog. Sharing is caring my dear.